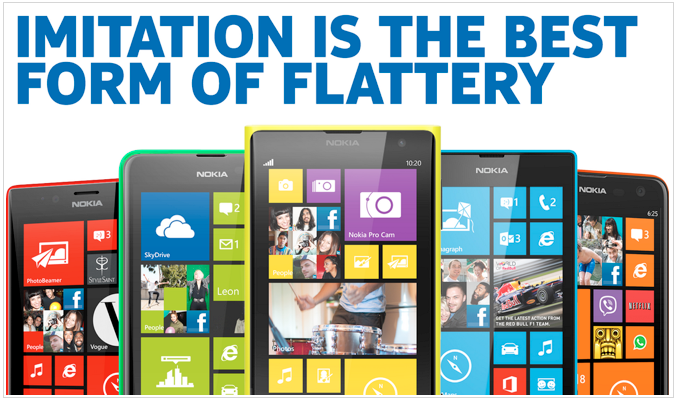 Nokia isn’t shy when it comes to trolling Apple. You can check out the wondering and stunned iPhone zombies commercial here, or this ad that slams the iPhone 5 for only coming in black and white. Today, during Apple’s iPhone 5C announcement, Nokia UK took to Twitter once again and declared that “imitation is the best form of flattery” by showing a bunch of colourful Lumia Windows Phone 8 devices. The iPhone 5C was unveiled today and is Apple’s first foray into colour as it’ll be available in green, yellow, blue, white and red.